Early in the week, Steven Wilson posted a previously unreleased song on his Soundcloud page. Entitled ‘Cut Ribbon’, the song was originally intended for a metal project he was working on with Opeth’s Mikael Akerfeldt in 2001. 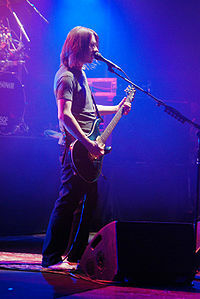 Since then the two’s relationship has expanded with various collaborations in the mixing and producing of Opeth albums. Of course the two have been scheduled to work together for many years and finally did so in late 2010 and throughout 2011 with the working title Storm Corrosion. An album from the project is rumoured for release next year. While it’s completely unrelated to Storm Corrosion, here’s ‘Cut Ribbon’ for your enjoyment.